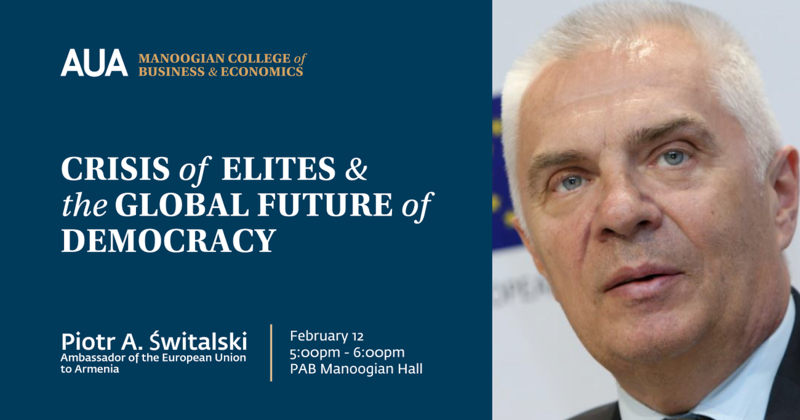 The speaker of the open lecture will be Piotr A. Świtalski, the Ambassador of the European Union to Armenia. Piotr A. Świtalski is a career diplomat with the rank of titular ambassador. Since September 2015 he is the Head of the Delegation of the European Union to Armenia with the rank and the title of Ambassador Extraordinary and Plenipotentiary. In his career he has held a number of important posts, including Deputy Foreign Minister in the government of Marek Belka (2005), Permanent Representative of Poland to the Council of Europe (2005-2010), Director for Policy Planning at the Council of Europe Secretariat (2010-2014), Director for Policy Planning in the Polish Foreign Ministry (2002-2005), Director for Asia and the Pacific in the MFA (2015), Senior Diplomatic Advisor to the OSCE Secretary General (1993-1996). He studied at the Warsaw University and the Moscow Institute of International Relations. He holds the PhD degree in history. He has published many scientific articles and five books on international politics.